Hartford Stage opened its 2019 season with the world premiere of Bess Wohl’s provocative and disturbing play, Make-Believe. 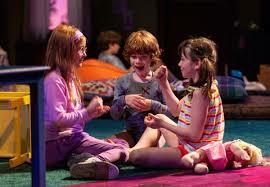 Set in an attic playroom, the play is divided into two distinct parts and tries to cover a lifetime. Make Believe begins with children playing on stage as the audience is being seated. Their toys allude to this being sometime in the 1980s. These siblings seem happy and well-adjusted until their play begins to mimic angry adult behavior they probably witnessed. No parents or adults are in the house. It turned out that their father left on an extended business trip and their mother was just absent. The second half of the play takes place in the same attic playroom roughly 25-30 years later. The siblings, now adults, returned home for a funeral. To say more would give too much away. Much Ado About Nothing is really something!